At CorLux Financial, we believe every individual needs outstanding financial advice from a trusted advisor. And that’s not just in the short term — that’s for life. Our clients are family members to us. Family is for life, and that’s why our goal is to serve you long term, evolving our approach with your changing needs. 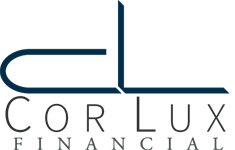 Our name, CorLux Financial, comes from the Latin words “cor” and “lux” which mean “heart” and “light”. This is precisely what we bring to our work with you. We put our heart into our experienced management as we shine light on each of our clients’ paths to financial success, cheering them on every step of the way.